We provide a 5 year Guarantee with all our machines, to register please complete the form below. This guarantee is not transferable. It will be invalidated if the equipment is damaged due to misuse or has been modified or altered. Normal wear and tear of tumbler barrels, end caps and drive belts is not covered under the guarantee. Beach Lapidary is a small UK family-run business that manufactures metal barrelling machines, stone tumbling machines and facet saws designed for cutting small or precious stones. We also sell spares, polish, grits, jewellery kits, burnishing soap, steel and stainless steel media. Beach Lapidary can also service or renovate used lapidary machines. 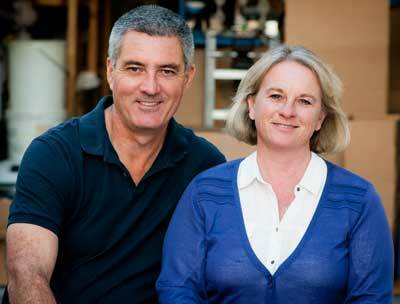 This British company is run by husband and wife team, David and Fiona Lascelles from their workshop in Surrey. The company was founded by British engineer, Mike Beach, who developed the low cost, affordable tumbling machines over twenty years ago. We only sell our machines to the trade but you can buy spares, media and accessories from our spares shop. We will be pleased to help with any repairs you require. Get in touch. © Copyright Beach Lapidary Ltd All rights reserved.